Update: This problem seems to have been addressed in a recent update to iTunes. The program now stops looking around 100 missing files before giving the warning dialogue. So if you’re having this problem, make sure you’re using the latest version. 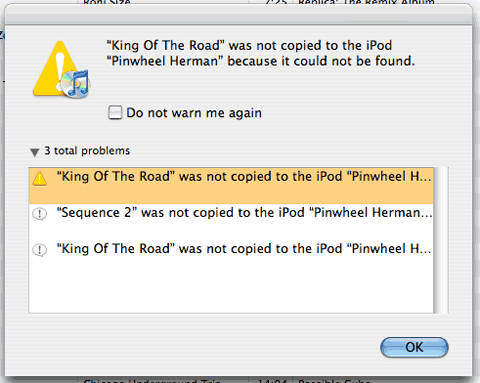 One of iTunes 7 handy new features is the “sync problems” warning. The screen pops up whenever you try to sync your iPod with your iTunes library and song/video/podcast files cannot be found. Previous versions of iTunes only let you know there was a problem; iTunes 7, however, helpfully tells you which particular files are missing. It’s a nifty function for tracking down errant files that iTunes has somehow lost or forgotten about. or which you may have accidently deleted. But that helpfulness can cause problems in certain instances. You see, I have a rather large iTunes library: 14,000+ songs that take up ~78GB of hard disk space. So I keep all my song files on a dedicated external hard drive, a hard drive that isn’t always turned on. In previous versions of iTunes, if song files could not be found when attempting to sync your iPod, you would just get a warning about a single missing file, but all your recent play stats (play count, star ratings, last played) would still be updated from the iPod into the main iTunes library. However, when doing the same thing in iTunes 7, the program begins to compile its detailed report. In my case, if the external library is not mounted on the desktop and i try to sync my iPod, iTunes then starts trying to find all 14,000+ missing song files. The program seemingly freezes (the dreaded beachball) while it is processing all those missing files. The only options are to wait for it to finish (which takes more than an hour on my Intel iMac) or force quit (and lose any stored play count and last played data from the iPod). I found this out the hard way, twice, before I realized what was going on. So, just a quick word of advice: if you’ve got an external library, make sure it is powered on and mounted before opening iTunes.